"The firm didn't clean during the Féile festival when it landed in Thurles (the Ryan's home town) in 1990, but Pat was asked if he was interested in helping them out the second year - and that's how it continued," Managing Director Elaine Ryan told independent.ie. As the event industry grew, so too did Ryans as they perfectly filled a gap in the market as a firm who could manage large event cleaning operations - and do it well. "Because he has been there from the start, Pat has built up many connections, helping the business to get the contracts for some of the largest and most well known events in Ireland and the UK." It was important to the event organisers that they had someone on board that understood the importance that everything had to go well on the day, a priority that Ryans Cleaning holds to this day. Even their company mission statement "is to enhance the visitor experience at each venue/event while minimising interference with the day to day running of the event". 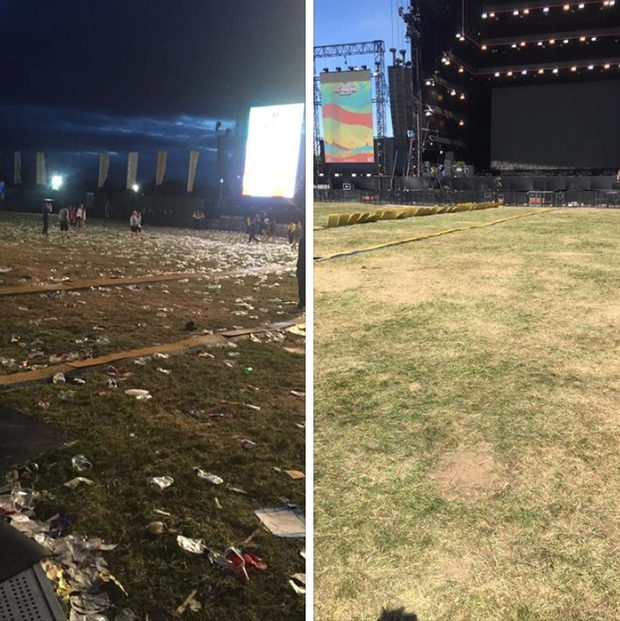 For events like last weekend's Electric Picnic, organisers place their trust in the hands of the Ryans Cleaning team to adhere to these high standards over the three days - and in the overall cleanup several days afterwards. But planning for such large scale outdoor events is not an easy task; it takes place months in advance and are arranged and scheduled with military precision. "One of the keys things is that we have our own team leaders and supervisors; all our members of staff have to understand our way of working - and that the event running smoothly is essential," said Elaine. "They have their placements, they know what areas they need to cover; whether it's litter picking in the arena, the campsites, the car parks and roads or cleaning the artists' areas." For Electric Picnic, Ryans Cleaning have an on site office located behind one of the campsites where all team members check in and check out. Led by a male and female leader, the teams are organised at this before they carry out the detail required for each particular shift. This year's festival is over for fans but it will take the Ryans team a few days "before the weekend" to get the Stradbally site back to its original state. After "sign off from managers, and a drive around with the site managers and the estate owners", the Ryans team will be able to celebrate a job well done. But there's no rest for long as the Ploughing Festival, which unofficially marks the end of the firm's season, is just around the corner. "In Ireland, we have about 46 full-time staff but that number can scale up to 300 or 400 people with temporary staff when covering the larger events," Elaine said. Year round, Ryans maintain a contract at Croke Park, the 3Arena and Dublin Zoo - and at the horse racing throughout the winter - but their plans for international growth are just beginning to pick up pace. V Festival in Telford was the first event the company undertook in the UK in 2005, an event the company continues to service 13 years later. In the last five years, in particular, Ryan's profile has grown across the water with a number of popular music and outdoor events, including the Queens Jubilee celebrations in Hyde Park in 2012. "We've just won the contract for our first Premier League football stadium, Watford, and we're hoping that this is the start of something a lot bigger," said Elaine. Some 30,000 normal bags, 10,500 wheelie bags and 3,416 pairs of gloves were used in the clean up operation of the 600 acre Stradbally festival site alone.